It's Monday, and it's Nancy Nickel here with a new Tutti Designs share! 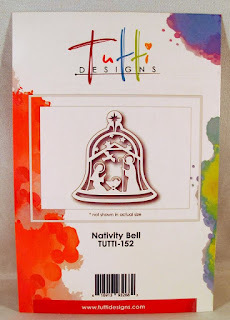 For my card this week I used the lovely "Nativity Bell" die. I added a black cardstock panel to the front of the card. I cut the pretty designer paper a little bit smaller than the black. I positioned the Nativity Bell Die where I wanted it and cut it out. I did the same with a label die for the sentiment. I then cut the bell out of the red designer paper. and popped the red die-cut piece into the hole where I had cut the die out. I did the same process with the sentiment. Finally, I added some rhinestone strips in the corners. Just BEAUTIFUL Nancy! What a fabulous design that really showcases this gorgeous die! Thanks for sharing such wonderful inspiration!